Eugene is a city of the Pacific Northwest located in the U.S. For maps, other places to visit, traveler tips, and tourist information, go to the Eugene holiday builder tool . Seattle to Eugene is an approximately 3-hour flight. You can also drive; or take a bus. In March, daytime highs in Eugene are 57°F, while nighttime lows are 39°F. You will leave for Fresno on the 16th (Sat). Start off your visit on the 16th (Sat): get to know the fascinating history of Old Fresno Water Tower and then pause for some serene contemplation at St George Greek Orthodox Church. To find reviews, traveler tips, maps, and more tourist information, you can read our Fresno trip planning site . Fly from Eugene to Fresno in 5.5 hours. Alternatively, you can do a combination of bus and flight; or drive. In March, Fresno is a bit warmer than Eugene - with highs of 72°F and lows of 49°F. Wrap up your sightseeing on the 18th (Mon) early enough to travel to St. George. St. Start off your visit on the 18th (Mon): take in the architecture and atmosphere at Pine Valley Chapel. To find other places to visit, reviews, more things to do, and tourist information, read St. George sightseeing planner. Traveling by flight from Fresno to St. George takes 4.5 hours. Alternatively, you can drive; or take a bus. The time zone difference moving from Pacific Standard Time to Mountain Standard Time is 1 hour. Traveling from Fresno in March, expect little chillier with lows of 43°F in St. George. Finish your sightseeing early on the 20th (Wed) so you can drive to Moab. On the 20th (Wed), take in the awesome beauty at Arches National Park. Here are some ideas for day two: stroll through Lions Park, explore the landscape on two wheels at Slickrock Bike Trail, and then hike along Park Avenue Trail. 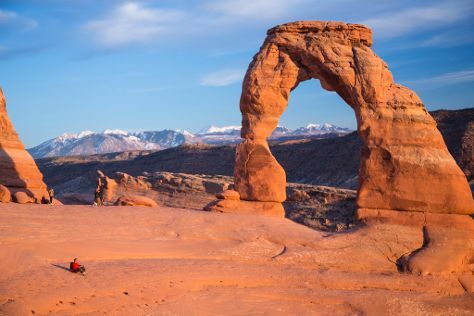 To find where to stay, reviews, other places to visit, and more tourist information, you can read our Moab trip itinerary maker website . You can drive from St. George to Moab in 5.5 hours. Alternatively, you can do a combination of flight and car; or do a combination of bus and car. In March, Moab is slightly colder than St. George - with highs of 62°F and lows of 32°F. Wrap up your sightseeing on the 22nd (Fri) to allow time to travel to Twin Falls. Twin Falls is the county seat and largest city of Twin Falls County, Idaho, United States. Start off your visit on the 22nd (Fri): hike along Rock Creek Park. To see where to stay, reviews, ratings, and more tourist information, read Twin Falls online visit planner . You can do a combination of car and flight from Moab to Twin Falls in 7.5 hours. Alternatively, you can drive; or do a combination of car, train, and bus. When traveling from Moab in March, plan for a bit cooler days and about the same nights in Twin Falls: temperatures range from 55°F by day to 33°F at night. Wrap up your sightseeing on the 24th (Sun) early enough to travel back home.